Burris Cleaning Service is a family-owned and operated company offering superior customer service throughout Western New York. Having been in the carpet and upholstery care business since 1991, owner and operator John Burris regularly attends trade shows and nationally recognized certification classes to expand his cleaning knowledge and to stay at the forefront of this constantly changing industry. John currently holds ten different certifications in seven different areas. This, in conjunction with his years in the industry, has earned him Master Cleaner status with the Institute of Inspection Cleaning and Restoration Certification or IICRC. The IICRC is the only nationally recognized professional organization to use standards set by the cleaning, flooring and furniture industries. In any profession, the true professionals are rarely the ones you’ve heard of. Why? Because you never needed them before. If you are reading this, you’ve likely heard of us through a friend, family member or quality-oriented retailer. We have achieved slow and steady growth through client referrals allowing us to focus on service, not advertising. The vast majority of our business is gained through word of mouth. We respect that. Our firm has never had any adverse reactions reported with any cleaning agents we use. Our primary cleaning method allows the most thorough cleaning possible, leaving no residual product behind. Our cleaning solution contains NO SOAPS and NO HARSH CHEMICALS! That’s good for you AND for our environment. Rochester’s Best Cleaning Service Just Gets Better. 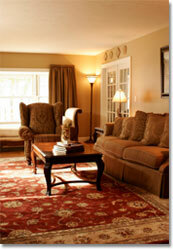 Burris Cleaning Service is constantly striving to improve our service to you, our valued customers. Let us know what you think about what we’re doing, what we could do better, and what you’d like to see us do that we are not currently doing. We invite you to please rate our cleaning services and let us know how you feel we could better improve our services. We will be evaluating your comments, because what you think is very important to us. Occasionally, we will draw one lucky name from those who participate in this short survey and awarding that customer with a $25 gift certificate toward future cleaning services with Burris Cleaning Service. This is our way of thanking you for your time and patronage. We look forward to serving you for years to come. We hope you will find this information useful. Please contact our office at 585-589-1754 with any questions, or to schedule your appointment.